August Hanning, a former head of Germany’s foreign intelligence service, the Bundesnachrichtendienst or BND, is seen at a meeting in Berlin, Dec. 4, 2008. Hanning told Germany's Bild newspaper that he is concerned about intelligence-sharing with Austria, given apparent close ties of Austrian ministers with the Kremlin. A former German intelligence chief says NATO secrets aren’t safe to share with Austria, adding his alarm to growing concern among Western intelligence agencies about close ties between senior Austrian ministers and Russia. Fears have mounted about the security trustworthiness of Austria since a police raid last February on the headquarters of the country’s domestic intelligence agency, during which classified files were seized. The raid prompted allegations that Austria’s far-right government ordered it for political reasons. “There is, of course, extreme caution when sharing information,” August Hanning, a former head of Germany’s foreign intelligence service, the BND, told the German newspaper Bild. “It is essential for international intelligence-sharing that all sides can be sure their sensitive information is secure with a partner service. Secrecy must be maintained. That is, of course, incredibly difficult when you have such a situation in Austria,” he added. Senior figures in the Freedom Party, which is in a coalition government with the conservative Austrian People's Party, or OVP, have called for the lifting of Western sanctions on Russia, imposed for the 2014 annexation by Russia of Ukraine’s Crimea. Austria shunned the coordinated Western expulsions of Russian diplomats following the poisoning earlier this year of a former Russian spy and his daughter in Britain, which has been blamed on the Kremlin. 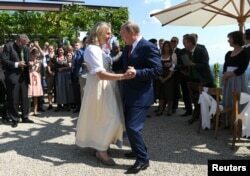 The increasing closeness between the Freedom Party and the Kremlin was underlined last week when Russian leader Vladimir Putin was the star guest at the wedding of Austria's foreign minister, Karin Kneissl, held at a vineyard in the picturesque Styrian hills of southern Austria. Putin’s attendance transformed the private event into a highly political one and prompted a storm of media criticism for Kneissl for curtseying before the Russian president. Austria's Foreign Minister Karin Kneissl dances with Russia's President Vladimir Putin at her wedding in Gamlitz, Austria, Aug. 18, 2018. The Washington Post reported last week, the day before Kneissl’s wedding, that several Western intelligence agencies had stopped sharing sensitive information with their Austrian counterparts, alarmed that their secrets could be shared with Moscow. Police officers during the February raid removed classified documents packed in crates and plastic bags. The anti-immigrant Freedom Party, which was founded by former SS officers in the 1950s, entered government at the end of last year. The party signed a formal cooperation agreement with Putin’s United Russia party in 2016. In June, Putin highlighted the warming ties between Vienna and Moscow when he chose Austria for his first official working visit abroad after being re-elected in March. The February raid on Austria’s domestic intelligence agency, the BVT, was officially undertaken as part of a joint operation with South Korea as part of a probe into the printing in Austria of false North Korean passports, according to government officials. But Austrian intelligence insiders believe the raid had a more sinister purpose, possibly part of an effort to find grounds to replace current officials with Freedom Party loyalists. Austria, a NATO partner, isn’t the only country that’s causing alarm to Western spy chiefs amid the rise of Kremlin-friendly populist parties across Europe. In March, VOA reported U.S. security agencies were assessing what intelligence could be shared with Italian counterparts following the formation in Rome of a coalition government featuring the right-wing Lega and anti-establishment Movimento 5 Stelle (M5S). Like the Freedom Party, Italy’s Lega has a formal cooperation pact with United Russia. 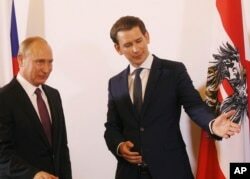 FILE - Austrian Chancellor Sebastian Kurz, right, gestures as he stands with Russian President Vladimir Putin in Vienna, during Putin's visit to Austria, June 5, 2018. U.S. intelligence officials told VOA that they feared leaks to Moscow. “Security risks would increase obviously,” one said, speaking on the condition of anonymity. “There would be a sharp downgrading of what we give the Italians, although this wouldn’t affect our exchanges when it comes to jihadists or terrorist threats,” a U.S. counterintelligence official said. M5S and Lega oppose Western sanctions on Russia, saying the sanctions have harmed Italy as much as Russia. In 2016, several Lega-controlled regions in Italy’s north adopted resolutions calling on the government in Rome to endorse Moscow’s annexation of Crimea and to recognize the peninsula as part of Russia. Relations between U.S. and Italian intelligence agencies are not as close as they are with some other Western and NATO countries. Intelligence relations between the United States and Italy were impaired in 2009 when an Italian court convicted in absentia a former CIA station chief and 22 other Americans, almost all agency operatives, for their involvement in the kidnapping of a Muslim cleric from the streets of Milan in 2003 and his transfer to Egypt.